Philippine Tarsier Tarsius syrichta (photo courtesy of PTFI). The amazing Philippine tarsier is known for its big, round eyes; bat-like ears; and ability to turn its head almost 360 degrees. This nocturnal and highly cryptic prosimian is related to the aye-ayes of Madagascar and bush babies in Africa. The only other tarsier species currently known are found in Malaysia and Indonesia. These animals move about silently in the forests by clinging to and leaping on vertical branches of trees and saplings. Tarsiers once widely roamed the tropical rain forest of the southeastern central islands of the Philippines. The Philippine tarsier has previously been reported as rare and decreasing and listed as endangered by the World Conservation Union (IUCN) in 1990. It has been described as threatened due to heavy deforestation, extensive hunting for the pet trade, and increasing agriculture in its natural habitat. The IUCN/Species Survival Commission Primate Specialist Group gave the species a Conservation Priority Rating 4, defining the species as highly vulnerable with the remaining population threatened by habitat destruction and hunting. It is currently listed by the IUCN as Data Deficient. To fill in the gap of knowledge on its ecology and behavior, a team comprising Filipino researchers affiliated with the University of Adelaide, South Australia, started conducting field data collection in the Philippine island province of Bohol where a radiotelemetry project incorporating GIS concluded in 2001. Their goal was to provide information that can be used as a sound basis for planning and implementation of management and conservation programs. Minimum convex polygon home ranges of Philippine tarsiers. 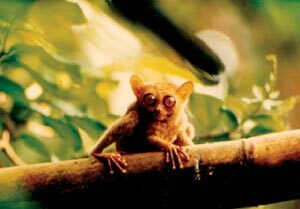 The tarsier is found in the limestone rolling hills of Bohol among other islands in the Greater Mindanao faunal region. The area is generally mountainous with rough terrain broken by deep gullies, ridges, and abrupt slopes. It averages 1,307 mm of rain per year. Tarsiers are known to be solitary animals. Prior to this study, most of the observations on the animal's behavior were taken in a captive setting. Because these animals do not thrive in strict confinement, attempts to breed them in captivity produced dismal results. The decision to study them in the wild was, therefore, timely and appropriate. Field experts trapped a total of 11 individuals including four adult males, six adult females, and one subadult male. Radiocollar transmitters were attached to each tarsier's neck. The study area was traversed by foot and mapped according to vegetation type, physical characteristics, and land use patterns. This was important in determining the habitat use and preference of the animal. 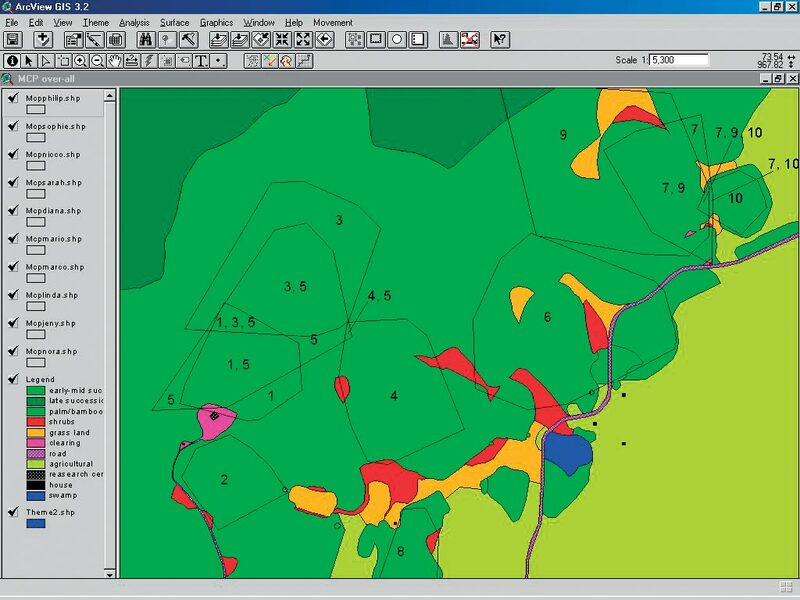 The team then entered the habitat map into ArcView 3.x, which was converted to both vector and raster data models. One to three animals were tracked at night using a flashlight with a low-powered battery to help visually locate the animals. However, most of the time, the locations of the animals were determined by remote triangulation. 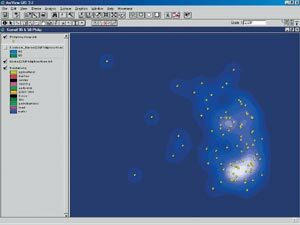 ArcView was used because of its extension programs that allow easier manipulation of data. It was also highly recommended by the information technology officer of the Applied and Molecular Ecology Department, University of Adelaide, South Australia. The ArcView 3.x extension, Animal Movement Analyst (developed by the United States Geological Survey to study animal migration and movement patterns), was used to calculate and map out male and female home ranges, degree of home range overlap, and extent of habitat use. 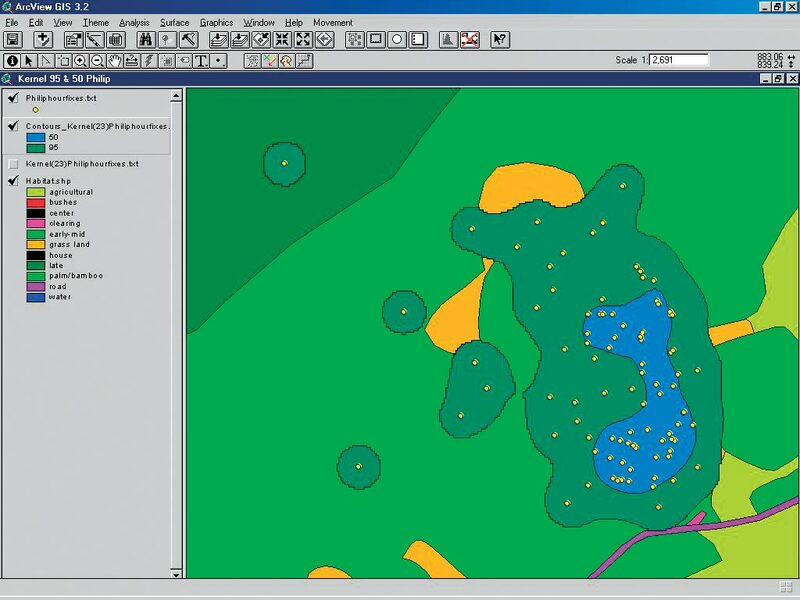 Animal Movement Analyst, in conjunction with the ArcView Spatial Analyst extension, worked in multiple projection systems, used selected records (enabling complex queries or selections), and integrated with many types of spatial data. Ninety-five and 50 percent kernel probability polygon on habitat map in raster format. Size and shape of home ranges of radiocollared tarsiers were determined using the Minimum Convex Probability polygons and Kernel (i.e., grid cell) Home Range estimates. The Animal Movement Analyst extension also allowed nearest neighbor analyses to determine pair bonds and the extent of range overlap between individuals of the same and opposite genders. Movement and activity patterns, as well as nightly distances traveled, were traced and calculated using Create Polyline from the Pointfile Option of the extension. The zigzag pattern of tarsier movement was a classic representation of solitary animal movement. Males average almost 2 km per night in their nocturnal travel, but females cover only half that distance. This data was determined by continuous tracking that involved acquiring locational fixes every 15 minutes within a six- or 12-hour shift. Map overlay analyses were performed to determine the extent of use of a particular habitat type by radiocollared individuals. Determining the extent of habitat use by the tarsiers required the use of the raster data set, and the observed values accounted for the total pixel counts per habitat of all the radiocollared tarsiers. The radiotracking, including creation of reference points and cutting down of trails and footpaths in the rain forest lasted 10 months. It yielded interesting results regarding the tarsiers' behavior and ecology. Tarsiers tend to avoid their capture sites. Although males and females are never seen together, their ranges overlap significantly (males often have more than one or two mates in their lifetimes). Rainfall greatly limits the tarsiers' movement. Pregnancy, as well as carrying infants during the preweaning period, restricts the movement of females. Tarsiers stay roughly one meter above the ground most of the time, but they will climb up to the canopy as high as four to five meters. Ninety-five and 50 percent kernel probability polygon of a radiocollared male tarsier. After a flurry of activities at the onset of dusk and a bout of feeding, they sit still. Tarsiers were observed to savor crickets, which requires them to forage near the ground. This makes them easy targets of feral cats, the number one predator in the area. Tree snakes are also believed to be predators. In addition, tarsiers' preference for crickets makes them stay near the periphery of the forest. Although they are nocturnal, a male was tracked and found to be active after 7 a.m., but he was moving so fast that he appeared to be in a hurry to get back to his sleep tree. One male was even seen hopping like a kangaroo as he crossed a narrow grassy strip between adjoining forest patches. Philippine tarsiers were observed to avoid agricultural areas, unlike their counterparts in Sulawesi and Borneo. This behavior can be attributed to the fact that the agricultural land within the study area in Bohol covers only rice fields and coconut plantations and does not provide any suitable substrates for the tarsiers. For more information, contact Irene Neri-Arboleda, Department of Biology, De La Salle University, No. 2401 Taft Avenue, Manila, Philippines (e-mail: arboledai@dlsu.edu.ph).